A project of new music inspired by the prize-winning novels of Marilynne Robinson. January-June, 2011. 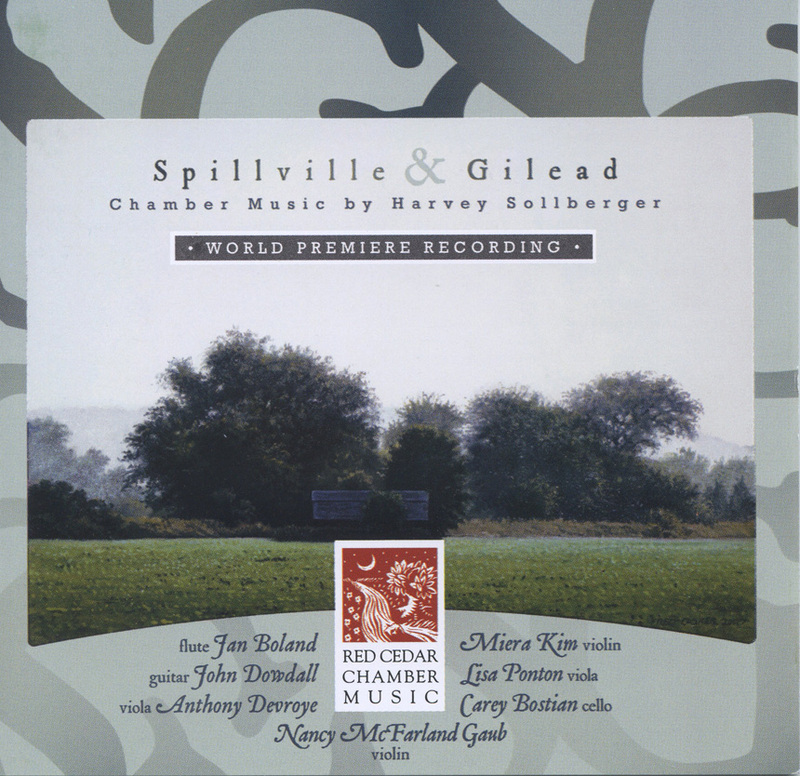 Perhaps Gilead is a three-movement (35 minute) composition by Marion, Iowa native and internationally renowned composer Harvey Sollberger. Perhaps Gilead was inspired by the companion novels Home and Gilead written by Pulitzer Prize-winning Iowa novelist Marilynne Robinson. Red Cedar Chamber Music commissioned Perhaps Gilead and performed it in a series of 27 concerts and educational events – culminating with official premiere concerts at First Presbyterian Church in Cedar Rapids on May 21, 2011 and at St. Raphael Orthodox Church in Iowa City on May 22, 2011.T he project was made into a short film by film maker John Richard. The project Perhaps Gilead was funded in part by the Iowa Arts Council, a division of the Iowa Department of Cultural Affairs and the National Endowment for the Arts, which believes that a great nation deserves great art. Hear the final movement live in concert on YouTube. 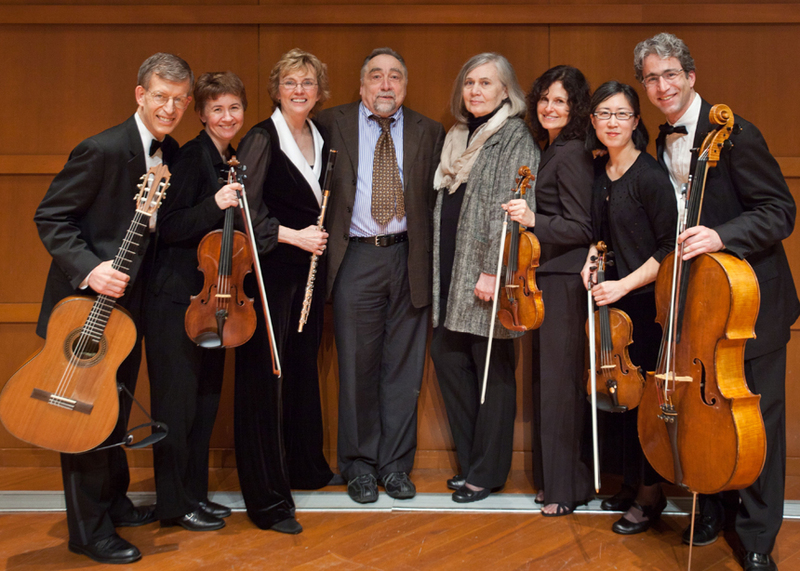 The Gilead Project: From left: John Dowdall (guitar), Lisa Ponton (viola), Jan Boland (flute), Harvey Sollberger (composer), Marilynne Robinson (author), Nancy McFarland-Gaub (violin), Miera Kim (violin), Carey Bostian (cello). 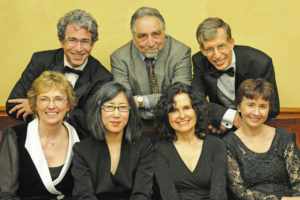 Photo taken by John Richards after the concert at Grinnell College, April, 2011. • Harvey became a leading exponent of contemporary composition and expanded instrumental techniques on the flute while at Columbia University where he co-founded (with Charles Wuorinen) the Group for Contemporary Music in New York at Columbia University in 1962 and directed that ensemble for 27 years. • Sollberger was born in Cedar Rapids but was raised and attended elementary through high school in Marion and then attended the University of Iowa. • Sollberger has had numerous major commissions but is recently retired from University of CA San Diego. • Sollberger now lives in Strawberry Point, Iowa and is Red Cedar Chamber Music’s composer in residence. The Iowa Inspiration of Perhaps Gilead : Red Cedar Chamber Music commissioned Harvey Sollberger to write a 15 minute work for flute, guitar and string quartet and he became so immersed in the project he wrote us a 30 minute work. • Harvey became engrossed with the Iowa-based novels Home & Gilead by Pulitzer Prize-winning novelist Marilynne Robinson, who teaches at the Iowa Writer’s Workshop. • His new musical work interprets the philosophical and emotional content of these novels in soundscape. Home & Gilead are companion novels by a renowned Iowa author Marilynne Robinson about her fictional small town of Gilead, Iowa. Set in the 1950s, Home & Gilead deal with important social & philosophical issues ie. slavery/integration as seen through the eyes of two ministers in the town who are lifelong friends. • Violinist Nancy McFarland Gaub is Lecturer in Music at Grinnell College. • Flutist Jan Boland is Co-Founder and Executive Director of Red Cedar Chamber Music. • Guitarist John Dowdall is Co-Founder and Artistic Director of Red Cedar Chamber Music. • We were honored to have novelist Marilynne Robinson join us by reading excepts from her novels in concerts at Grinnell and Marion. Composer, conductor and flutist Harvey Sollberger has been active in many world musical centers. Performers of his music have included the New York Philharmonic, the San Francisco Symphony, Tanglewood, June in Buffalo, Interlink (Tokyo), Radio France and Pierre Boulez’s Domaine Musical (Paris), TRANSIT (Belgium) and Incontri di Musica Sacra Contemporanea (Rome). Among his honors are the Award of the National Institute of Arts and Letters, two Guggenheim Fellowships and commissions from the Fromm, Naumberg and Koussevitzky foundations, Music from Japan, the NEA and various state arts councils. Sollberger was a co-founder of the New York Group for Contemporary Music and has led the Contemporary Ensemble of the Manhattan School of Music, Indiana University’s New Music Ensemble and SONOR and Sirius at the University of California, San Diego, where he served, as well, as Music Director of the La Jolla Symphony and Chorus from 1997 to 2005. His orchestral performing credits include appearances with the San Francisco Symphony, the San Diego Symphony, the American Composers Orchestra, and the Buffalo Philharmonic. His work as composer and performer is represented on over 150 commercial records. He has been Resident Composer at the American Academy in Rome and Composer-in-Residence for the San Francisco Contemporary Music Players and Red Cedar Chamber Music. He lives in Iowa where he feeds hummingbirds and is at work on plans for a 30-acre sound garden. 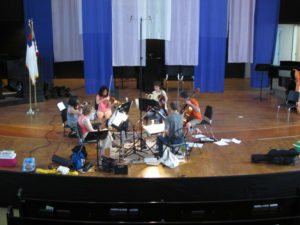 In June, 2011 the artists recorded Perhaps Gilead in King Chapel on the college campus of Cornell College in Mount Vernon, Iowa. Perhaps Gilead appears on a compact disc titled Spillville and Gilead: Chamber Music by Harvey Sollberger released by Fleur de Son Classics (NY) and distributed by Naxos International. The recording project was funded by gifts from the Sollberger Gang of Five (Chuck Peters, Joanne Chadima, Grinnell College, Laird &amp; Patricia Addis and Clara “Peach” Moore), the Iowa Arts Council, and a generous gift from Mr. John Castle. 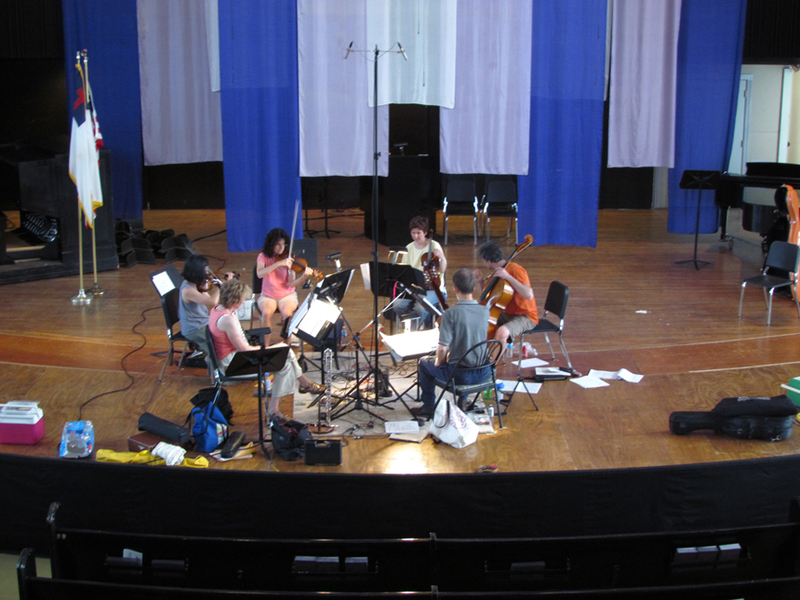 Thanks to Cornell College (Mount Vernon) for providing the recording space – King Chapel. by the composer, Harvey Sollberger. Perhaps Gilead was written in 2010 and is scored for for flute, guitar and string quartet. Perhaps Gilead would not exist without the novels Gilead and Home by Marilynne Robinson. Ms. Robinson’s gift for linking the everyday to the eternal shows us that life is here and now – here and now but also everywhere and everywhen in that our thoughts and deeds reach and reverberate far beyond our immediate surroundings and wildest imaginings. She reminds us of the distinguished history and implied promise (or is it a threat?) bound up in Ulysses S. Grant’s dictum, “Iowa, shining star of radicalism”, as her novels simultaneously depict our earthborne nature offset by our ability to hope and remember, dream and imagine. Hers is not an easy universe, but it is, coupled with our effort and attention, a redeemable one in which a field alight with flickering fireflies can evoke the smoldering earth: “well, it was and it is. An old fire will make a dark husk for itself and settle in on its core, as in the case of this planet. I believe the same metaphor may describe the human individual, as well. Perhaps Gilead. Perhaps civilization. Prod a little and the sparks will fly”. Movement I, Constructing a Horizon: Prairie Sunset and Moonrise, was inspired by an incident described on page 14 of Gilead where the boy who will become Reverend Ames, on a visit with his father to the wilds of Kansas to find his grandfather’s grave, looks up and sees the setting sun and rising full moon balanced on their respective horizons with “the most wonderful light between them”. “I never could have thought this place could be beautiful. I’m glad to know that,” says his father. I saw this myself on January 29, 2010 in Strawberry Point, Iowa. Movement II, The Armed Man references the conviction and near-Biblical intensity of Ames’s grandfather, an abolitionist and fighter – in a literal sense – for slavery’s end. In Gilead, William Faulkner’s words – “the past is never dead, it’s not even past.” – return to doubly haunt us as we perceive slavery’s ongoing legacy both in the novel’s 1950s setting as well as in our present historical moment. Movement III, Medley-Potpourri: Sunday Afternoon Music at Reverend Boughton’s, is set as an opera scene without words, and draws its scenario from pages 188 and 189 of Home from “they ate their pie” through Lila’s saying, “that’s a good song, though.” The three characters who speak in this passage, Reverend Boughton, his son, Jack, and Reverend Ames’s young wife, Lila, are “sung”, respectively, by the first violin, cello and viola in a series of recitatives. The text, though not spoken or sung in performance, is written beneath the notes so that each player knows what he or she is “saying”. I think that much of Jack’s essence is captured in this scene – his mercurial imagination and playfulness, his sense of humor and self-wounding bitter irony and, finally, his despair. This is counterbalanced here by the serenity of Lila and the yearning severity of his father. The medley-potpourri aspect of the title refers to the music Jack performs on the piano at this Sunday gathering – a succession of hymns as well as a sentimental ballad (“potpourri” in French means literally “rotten pot”, and refers to a stew made of different kinds of meat; it later came to refer to a medley of different musical works joined together and played in succession). Movement III references and quotes all of the music mentioned in the novel’s text, making, in effect, a potpourri of the pieces performed in Reverend Boughton’s parlor. To further tax the opera metaphor, we might see Perhaps Gilead‘s quoted hymns and songs as equivalent to the arias set between and counterbalancing characters’ recitatives in eighteenth-century opera. Can Movement III makes sense if the audience can’t hear the words and follow the “libretto”? I’m betting that it can, as a kaleidoscopically-evolving mosaic of the new and the familiar, the exotic and the mundane, powered (I hope) by elements of musical contrast and design, change and surprise that allow the music to penetrate beyond and behind the words to the emotional truths and experiences that called them into being. And finally, I think I should address the topic of musical quotation – or borrowing. During past years I’ve frequently found myself quoting from others’ works. I do this not from some rejection of the concept of authorship (hardly!) or from lack of inspiration, but to open a door to a broader context of musical reference and expression than I’d have without the quotations. Each quoted work or passage draws new and extended meaning from its relation to the music of mine in which it’s embedded, and in the tiny space between the incited/new and the recited/quoted, a charge of metaphysical lightening is coiled -up, one which when released flashingly illuminates the musical landscape through which the listeners, performers and I are passing. In broader terms, the quoted works already reside in me and form part of my mental and spiritual furniture. To reference them in my music is, in my terms, to supremely compliment them, and I do so with full respect for their uniqueness and creators. • January 10–13, 2011 • 4-day Residency (16 events) Music for Kids. At Jefferson High School, Cedar Rapids. • January 15 • Summit Pointe, Marion, IA. • April 19 • Oaknoll Retirement Residence, Iowa City. • April 21 • Music for Marion. Family Concert at Lowe Park, Marion, IA. • May 11 • Iowa City Connection. For Music Study Club. Parkview Church, Iowa City. • May 18 • First Presbyterian Church, Marengo, IA. • May 19 • Village Place, Marion, IA. • May 19 • Ainsworth Opera House, Ainsworth, IA. • May 20 • Wesley United Methodist Church, Vinton, IA. • May 21 • Main Stage Concert. At First Presbyterian Church, Cedar Rapids, IA. “I am so pleased to be in on the genesis of a major work! I love the Marion, Iowa connection involving both Red Cedar Chamber Music and the composer.” M.P. “Wonderful! I can’t tell you how much I enjoyed and profited from your concert (I read both books). And it was to wonderful hear you all play so gorgeously.” E.H.
“I could feel the story in each movement. The background is an excellent teaching tool; were you aware that the stained glass window was the ideal setting for this music? The full moon last night was just as described in the book – I live in the prairie and could see it and hear the sounds of birds and breezes- incredible depiction.” N.B. 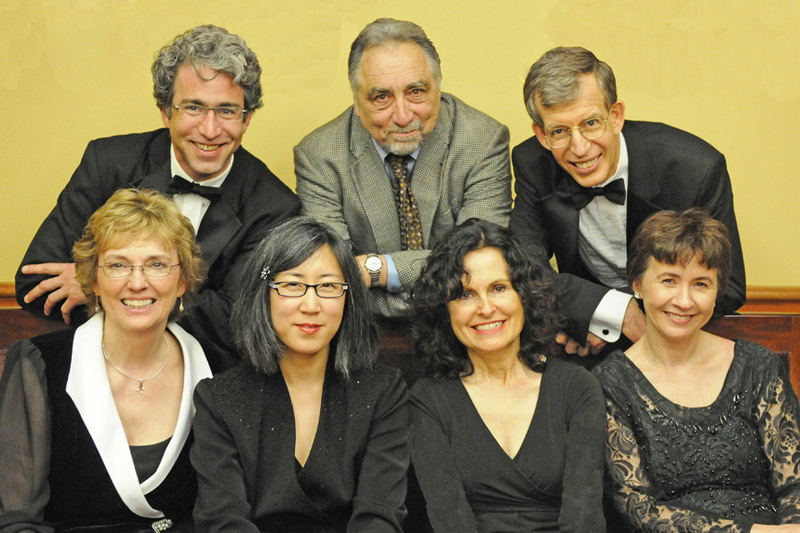 “Red Cedar is amazing – for this selection and performance of beautiful and sometimes unknown works, for their personally presented concerts that teach us as well as inspire and entertain us. We like the venues, too – charming settings for a full experience. A crown jewel for this area!” K.G. “This was the most meaningful music experience I’ve ever had.” K.M.